In a phenomenon that has spread like wildfire, seemingly everyone is doing “The John Wall Dance.” The Kentucky freshman phenom unknowingly started a pop culture dance move nicknamed, “The Blue Jesus“, that has become so popular to do, that it has been seen all across the globe as thousands of John Wall fans clamor to imitate his moves that he unveiled during player introductions at Kentucky’s Big Blue Madness pre-season celebration. The craziness has even spread to his teammates since fellow freshman, DeMarcus Cousins and even the Kentucky mascot were caught on tape doing the dance in celebration of the Kentucky program’s 2000 wins. 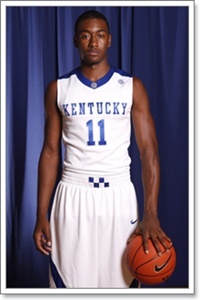 Wall’s moves were first imitated by the rabid Kentucky Wildcat fan-base, who instantly accepted Wall as one of the most hyped freshman to come to Lexington in recent memory. It became the cool thing to do, whether by the student section at KU games, while deer hunting, or by even 3 year old KU fans. But Wall’s new moves couldn’t be contained by just the United States as videos popped up everywhere like from The Great Wall of China, the Egyptian Pyramids, to even the Macy’s Thanksgiving Day Parade in New York. Even some of the entertainment business’s biggest stars just can’t resist doing the John Wall Dance like rapper Drake and actor Kris Joseph on ABC’s Cougartown. In basketball, anyone and everyone has seemingly been caught doing the John Wall, like the ESPN College Gameday Crew and most even Coach Calipari during a Hoops for Haiti Telethon. It’s refreshing to see Digger do some moves from this century. 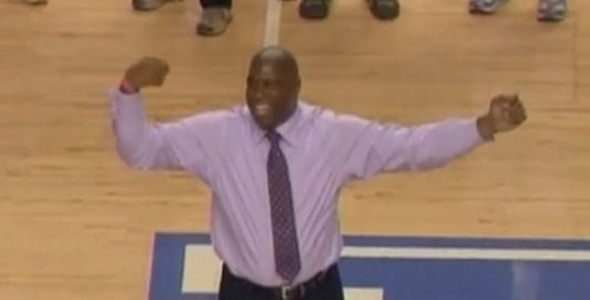 Following in the footsteps of Lebron James at the Vanderbilt game, NBA Hall of Famer Magic Johnson was in Lexington this week for the Kentucky/South Carolina game, as he was introduced as the letter ‘Y‘ in the halftime ritual of spelling out KENTUCKY on giant flash-cards. Allen Moll is an avid NBA and College Basketball fan who watches and studies games religiously and coaches youth basketball in his native Lehigh Valley region of Pennsylvania. Allen is a regular columnist for thehoopdoctors.com, Bleacherreport.com, UpperDeckblog.com, and his own site, Hoops Haven.